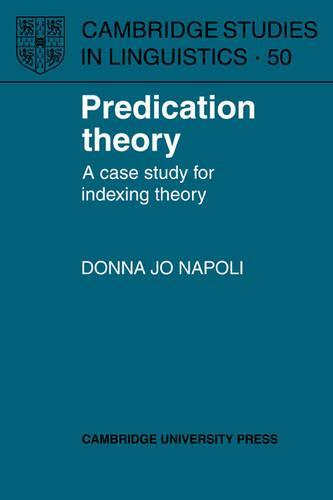 In this study Donna Jo Napoli takes a common-sense approach to the notions of argument and predicate. Discussions of predication within Government and Binding theory have stressed the configurational properties of the phrases involved, and Napoli argues that this has led to proposals for more and more elaborate syntactic structures that nevertheless fail to provide genuinely explanatory accounts. She presents a convincing case for viewing the notion of predicate as a semantic primitive which cannot be defined by looking simply at the lexicon or simply at the syntactic structure, and offers a theory or predication where the key to the subject-predicate relationship is theta-role assignment. The book then goes on to offer principles for the coindexing of a predicate with its subject role player. These coindexing principles make use of Chomsky's 1986 notion of barriers, but instead of being sensitive to configurational notions like c-command and governing category, Napoli argues that they are sensitive to thematic structure. In the final chapter of the book Napoli extends the principles for predication coindexing to anaphor binding, by introducing the notion of argument ladders.